I visited a new Masters Home Improvement store for the first time the other day. The store is very much like a Bunnings store but has additional products for sale such as a great range of interior lighting and wall decorations. Here is a picture of my daughter and my mum at Masters. 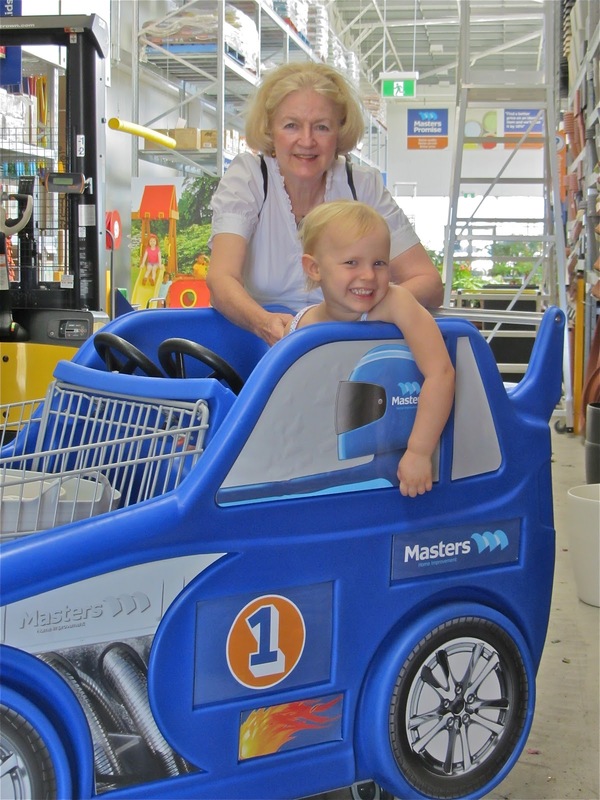 Check out the cute trolley that my daughter had so much fun riding in. I think the car/trolley is a great idea! Well done Masters. Here are a few items that I picked up from Masters - two new fibreglass pots (the big one is on wheels - very handy) and two new plants. 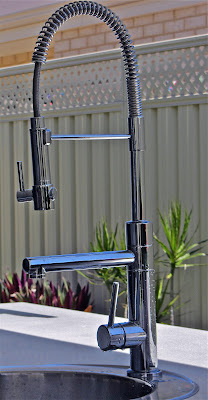 I also picked up this industrial looking tap which we have had installed in our back yard next to our bbq. 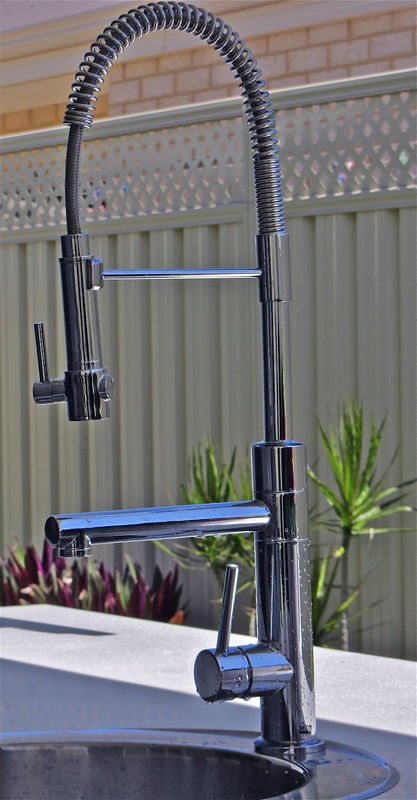 This tap was so much cheaper than other similar style taps sold elsewhere. I love how this tap adds a bit of bling to an otherwise boring sink. 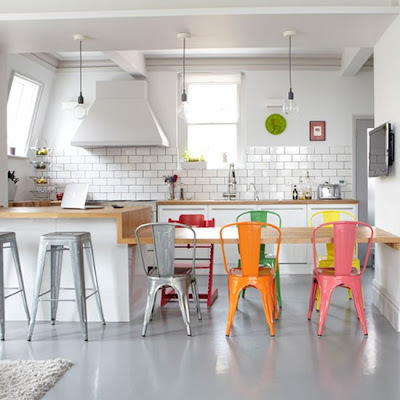 I love the subway tiles and pops of fun colour in the kitchen above. This kitchen looks so fresh! OMG! 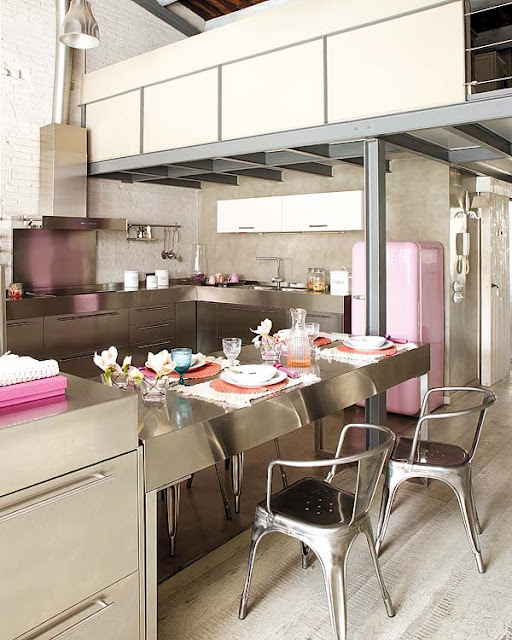 Check out the pink Smeg fridge. I'm in love! The pink works well - without looking too girly - due to being mixed with the stainless steel and the painted white brick wall. Don't know if I love all of the stainless steel. My little girl would have her little finger prints all over it in seconds. I hope that you are having a great weekend. I'll be back soon. I'd really love to be a part of community where I can get advice from other experienced individuals that share the same interest. If you have any suggestions, please let me know. Bless you! The Pink and Pretty Blog when I was surfing around reddit. depth information you offer. It's good to come across a blog every once in a while that isn't the same outdated rehashed information. 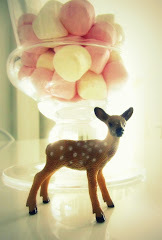 Browsing stumbleupon.com I noticed your blog bookmarked as: Blogger: The Pink and Pretty Blog. I am assuming you book marked it yourself and wanted to ask if social book-marking gets you a good deal of targeted traffic? I've been looking at doing some social bookmarking for a few of my sites but wasn't certain if it would produce any positive results. I do not know if it's just me or if everyone else encountering problems with your blog. It looks like some of the text in your posts are running off the screen. Can somebody else please provide feedback and let me know if this is happening to them as well? This may be a issue with my internet browser because I've had this happen before.